8 mm film is a motion picture film format in which the filmstrip is eight millimeters wide. It exists in two main versions — the original standard 8 mm film, also known as regular 8 mm or Double 8 mm, and Super 8. Although both standard 8 mm and Super 8 are 8 mm wide, Super 8 has a larger image area because of its smaller and more widely spaced perforations. 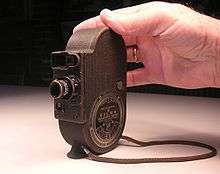 The standard 8 mm (also known as regular 8) film format was developed by the Eastman Kodak company during the Great Depression and released to the market in 1932 to create a home movie format that was less expensive than 16 mm. The film spools actually contain a 16 mm film with twice as many perforations along each edge as normal 16 mm film; on its first pass through the camera, the film is exposed only along half of its width. When the first pass is complete, the operator opens the camera and flips and swaps the spools (the design of the spool hole ensures that the operator does this properly) and the same film is subsequently exposed along its other edge, the edge left unexposed on the first pass. After the film is developed, the processor splits it down the middle, resulting in two lengths of 8 mm film, each with a single row of perforations along one edge. Each frame is half the width and half the height of a 16 mm frame, so there are four times the number of frames in a given film area, which is what makes it cost less. Because of the two passes of the film, the format was sometimes called Double 8. The frame size of regular 8 mm is 4.8 mm × 3.5 mm and 1 meter of film contains 264 pictures. Normally Double 8 is filmed at 16 frames per second. Common length film spools allowed filming of about 3 minutes to 4.5 minutes at 12, 15, 16 and 18 frames per second. In 1965, Super-8 film was released and was quickly adopted by the amateur film-maker. It featured a better quality image, and was easier to use mainly due to a cartridge-loading system that did not require re-loading—and re-threading halfway through. Super 8 was often erroneously criticized, since the film gates in some cheaper Super 8 cameras were plastic, as was the pressure plate built into the cartridge; the standard 8 cameras had a permanent metal film gate that was regarded as more reliable in keeping the film flat and the image in focus. In reality, this was not the case. The plastic pressure plate could be moulded to far tighter tolerances than their metal counterparts could be machined. A number of camera companies offered single width 8 mm film in magazines or spools, but the format faded when Kodak introduced Kodachrome, as this was only available in the double 8 mm format. The first single run 8mm film was offered in 1935 with a Bell & Howell movie camera Filmo 127-A called Straight Eight. Single width 8 mm film revived in the United States by Bolsey-8 in 1956, and continued for some time outside the United States, with Agfa Movex 8 and Svema offering reversal film. ↑ Baumgarten, Martin W. "8mm Film Gauges (archived page)". Lavender.fortunecity.com. Archived from the original on January 23, 2012. Retrieved 2014-03-15.